Speaking to Itar-Tass press agency, general director Dmitry Popov of Sports In (Sports Engineering) assured the public Russian World Cup stadiums won’t prove more expensive than those in other countries. “There is a notion that value of our stadiums is higher than in other countries. Wrongly.” Said Popov. “We have worked with several consulting companies that are engaged in the football theme. They conducted a study and provided us with statistics on the cost of the stadiums that were built in the recent major tournaments. […] For example, at the stadium in Berlin was worth about €4,000 per seat and Wembley in London around €11,000. We have the most expensive stadium at the rate of €6,202 in Rostov-on-Don. All the rest - € 4,000-5,000 per seat”. Further examples given by Popov include Friends Arena in Stockholm (€8,400 per seat) and Emirates Stadium (€7,293). However, both sums stand in contrast to official data for both venues (in reality much lower in Stockholm, significantly more expensive for London). More importantly, though, only one of the above-mentioned examples is a major tournament stadium (Berlin), while others were built without taxpayer money as commercial projects. And furthermore, all of them have been subject to criticism over spending, Wembley being the most expensive stadium worldwide for several years. So instead of comparing to average price for a seat in a stadium of this size (40,000+ for group stage games), Popov selected some of the most expensive stadiums in their respective categories and gave them as evidence for reasonable budgets in Russia. And above all, the figures presented for Russian stadiums seem very reasonable only because Popov gave most recent estimations, using extremely low conversion rates of ruble. This is how Rostov-on-Don got below €7,000 per seat. 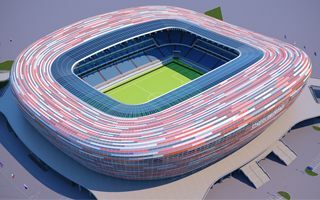 Last year with the immense budget of over 20 billion ruble it would have been well over €10,000 per seat, possibly the most expensive in history for a 40,000-seat stadium. Similar “cost decrease” was used with all seven stadiums ran by Sports Engineering, which makes their budgets indeed seem fairly average. But back when Russian currency stood more firmly, they were in fact the most expensive ever. According to Danish Institute for Sports Studies Brazil, which hosted the most expensive World Cup (stadium-wise) to date spent only 60% of Russian plans on stadia. As if this wasn’t enough, most stadiums for the Russian tournament are still in enabling-works or foundation phase and their prices have already gone through the roof, increasing by 60-80% compared to initial estimations. And Popov himself admits the price may go further up. “Is it possible for the value to increase? It is. Material costs to go up, even domestic? It is. Will there be irreplaceable imported equipment? There will be. In addition, there are some positions demanded by FIFA, which may of course increase the cost.” Popov goes on.